We are an experienced company in the furnishing of the full range of professional water treatment systems and Industrial reverse osmosis systems, so we can offer your company the right product for your treatment needs. - desalination of brackish well or ground water. The standard structure of our industrial RO systems is designed to ensure the maximum stability at the lowest operating and maintenance costs, with an very efficient modular design that allows to save space and to achieve flexibility. We well know that every source of water is different, so when the system is completed, we perform several extensive tests to ensure everything run flawlessy and the standards are observed in the entire flow (from the raw water to the pure water storage tank), case by case. 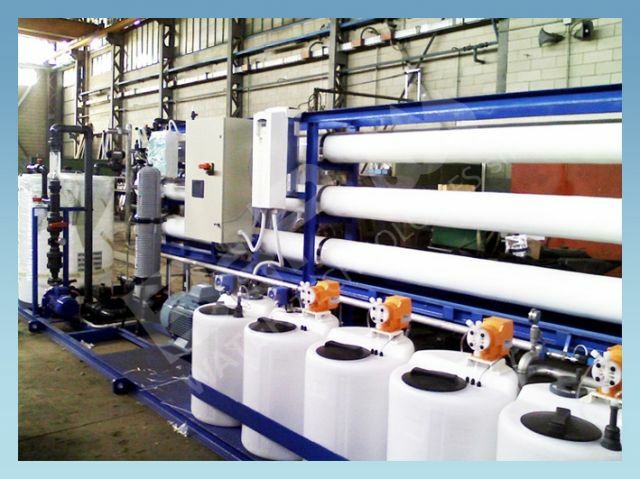 Pre-engineered Industrial Reverse osmosis systems for sale, with capacity of 200 m3/day. we can provide a wide range of accessories and options as well, such as chemical conditioning and Ultrafiltration pre-treatment. We have the experience and flexibility to work with you to provide whatever your company needs so contact us to discuss your particular requirements and our professional team can put together your customized package in the shortest delivery time.